Are you storing multiple types of chemicals? Many private facilities and government institutions use a variety of different chemicals to ensure that manufacturing processes are efficient and stay on track with production schedules. Making sure all chemicals are stored properly is necessary for factory and institution compliance as well as EPA regulations and NFPA codes. When storing different types of chemicals, multiple chemical storage buildings can be used when storing bulk quantities of hazmat; although this method may not be the most efficient way when using a FIFO or other inventory strategies. See below for a list of incompatible materials. Chemical storage buildings are a safe choice for storing multiple types of chemicals in one area; especially when incompatible materials are being used in the same general area. Chemical storage buildings allow the user to store incompatible materials in the same chemical storage building. Multi-compartment chemical storage buildings are engineered with solid partition walls, that can be designed with flammable or non-fire rated constructions, which provide incompatible chemicals with a safe and compliant storage solution. An example that is commonly found among companies that are storing various types of chemicals is the storage of flammables and corrosives. Flammables including, paints, oils and gasoline need to be stored separately from corrosives, including common liquid cleaning products and chlorine sodium bicarbonate. Chemical storage buildings that are going to be storing incompatible materials are designed with a segregated containment sump for use of multiple rooms or bays. This ensures a solid partition to prevent any chemicals to mix in the event of a chemical spill or leak within or outside your chemical storage building. 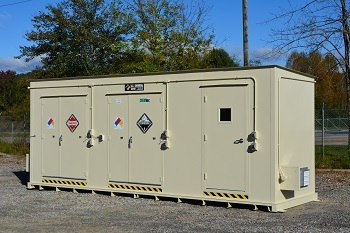 Multiple compartment chemical storage buildings can be equipped with a variety of safety accessories, specific for each type of chemical being stored. Accessories including integral fire-suppression systems, climate controls, mechanical ventilation, natural ventilation, alarm systems, vapor detection and more are available to ensure chemical safety for employees and properties. To learn more about chemical storage buildings or to receive a free chemical storage consultation visit us online or call 1-800-233-1480 to speak to a technical sales representative.